Why book a Las Vegas All-Inclusive Wedding package at the Little Church of the West? 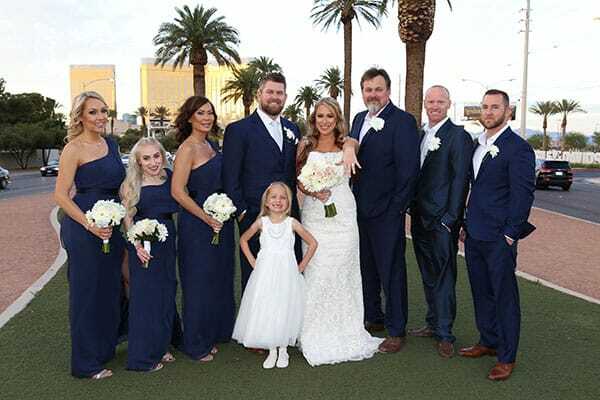 Las Vegas All-Inclusive Wedding – With this All-Inclusive wedding or vow renewal package at the Little Church of the West, you pay one price and you get everything. The than the $100 minister fee, the package price includes everything from Blue-Ray video, All the photos plus copyrights and even a photo shoot at the Fabulous Welcome to Las Vegas Sign. Extensive floral designs will customize your wedding party to the theme you are opting for. You Wedding Planner will help you every step of the way. The peace of mind that comes with this Las Vegas All-Inclusive Wedding ceremony package is where the real value is. Paying one price and knowing there are no other expenses or up-sales is priceless and available at our historic Las Vegas Wedding Venue. The minister fee is $100 and is payable in cash at the time of the ceremony.